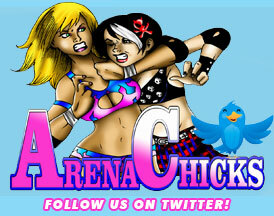 ArenaChicks.com » Blog Archive » Join us at the Cape Fear Tattoo & Arts Expo! Join us at the Cape Fear Tattoo & Arts Expo! The ArenaChicks will be making their next appearance at the Cape Fear Tatoo & Arts Expo on April 29 &30 in Wilmington, NC. This huge convention will feature live music, art seminars, tatoo contests, plus special appearances from Ivan Moody of Five Finger Death Punch and Ryan Martinie of Mudvayne and of course appearances & live wrestling presented by ArenaChicks! Visit our booth to get the scoop on the upcoming ArenaChicks comic book series and card game! Plus you can get your picture with any of the ArenaChicks! We will have Shelly Martinez, Angel Orsini, Amber O’Neal, Annie Social and Sumie Sakai at our tables plus copies of our DVD, photos, and more! This is going to be a HUGE EVENT that can’t be missed! For more info visit the Cape Fear Tattoo & Arts Expo website for ticket info and times!